Some music you've heard so much it becomes part of your DNA, part of who you are. Queen albums are like that for me. They become so familiar that you play them less frequently but upon returning to this album afresh for reviewing purposes, I was relieved to find this old acquaintance is still one of my best friends. The album comes at a point in history when only such a record could have been made. The band, having grown up with the Beatles phenomenon, were aware now of the possibilities of the album format. They were also influenced by the Harder Rock sound pioneered by the likes of Led Zeppelin and Jimi Hendrix, plus they were full of their own unique invention. The time was right for their kaleidoscopic sound. 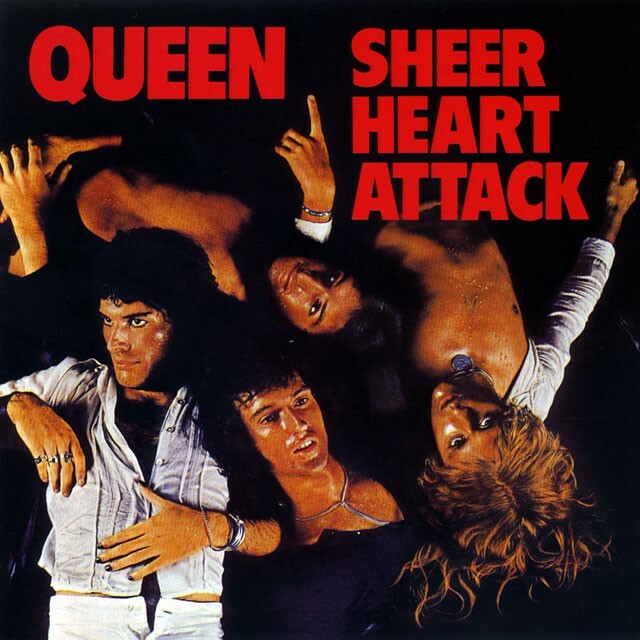 Nothing was off limits and that is no more apparent than on this diverse record; Rock albums rarely get more eclectic than 'Sheer Heart Attack'. It takes the Hard Rock of the underrated debut, adds the layered harmonies, fanciful arrangements and their developing studio trickery as evidenced on 'Queen II', and adds a new found sense of what it is to create a Pop song custom-built for mass consumption. This album was the template for all that we now think of as quintessentially Queen. The fact that it turned out so well is surprising as it came about under trying circumstances; Brian May contracted hepatitis and the band had to cut short their first US tour supporting Mott The Hoople. Despite this setback, his guitar playing is still all over the record, no more so than the two songs that top and tail the first side (if you're listening on vinyl). The first is the blistering Hard Rock of 'Brighton Rock' which consequently became his live showpiece, and a track that heralded him as a bonafide guitar hero. The other is the supercharged Rock 'n' Roll of 'Now I'm Here' with its guitar and vocal response demonstrating how well May and Freddie Mercury enhanced each other's creations. Every track is significant. The perfect Pop Rock concoction of 'Killer Queen' was broader in appeal than their previous single and was more sophisticated musically and lyrically. Mercury is in full flight, his creativity fire-cracking. The twin combination of the angry and aggressive 'Flick Of The Wrist' followed by the lovely, floating 'Lily Of The Valley' show his breadth in terms of arrangement and willingness to experiment with sound. His two 'In The Lap Of The Gods' tracks that start and end side two are a masterclass in how to use a recording studio. The "Wo wo la la" sing-along part was the first time the band were thinking about how an audience could become part of the show, something that many of their biggest songs would later feature. Other notable aspects of the record are 'Misfire' as it marks the first John Deacon song. Poppy and slightly throwaway for sure, but given the full Queen treatment it's still irresistible. As for Roger Taylor, his 'Tenement Funster' ranks as one of his most under-appreciated. Taylor had a good way with a lyric and this track is littered with nice emotive descriptions such as "Give me a good guitar and you can call my hair a disgrace, or just give me an open car, I'll make the speed of light out of this place" which encapsulate everything a young aspiring musician might feel. Many of the songs segue into one another which make it sound like a Classical suite at times, but as one song moves into the next you're struck with how different each track is; the pure Heavy Metal on the furious 'Stone Cold Crazy' was enough to get the nod of approval from Metallica, 'Dear Friends' is a poignant lullaby, 'She Makes Me (Stormtrooper In Stilettos)' has a hallucinogenic quality as if influenced by May's illness. The Vaudeville knees-up 'Bring Back That Leroy Brown' with genuine George Formby ukulele-banjo is pulled off with exuberance and panache that only Queen could manage. The album quite aptly ends with an explosion. Surely every album should end with one? Those that write Queen off as frivolous show-offs miss the point entirely. Some art is there to mirror the hardships of the human condition, while some is there to help you transcend life's trials and transport you to a place that is more beautiful and perfect. Queen was the gateway to the latter. Freddie chose well when he picked Mercury for his stage name as his and the band's talent was mercurial, making Rock music that is timeless and in the case of 'Sheer Heart Attack', peerless. As Mercury sang on 'Killer Queen'... "Guaranteed to blow your mind".